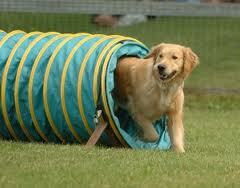 We don’t have a specific class for teaching agility, mostly due to a lack of a suitable venue. We do however run some fun sessions in the summer, and we do use agility equipment in our higher level classes. We do teach using Hoopers (a form of low contact agility) – its fun and a great teaching tool for distance and direction. It really adds to your off lead skills! This is taught in classes from unruly beasts upwards since you need some basic skills to progress from. We have had some handlers enrol with us because they want to clicker train their dogs to take part in agility, or to be working with their dog in the meantime as most local agility groups have a lengthy waiting list. For us, it’s not about how high your dog can jump, or how fast he can complete the course, it’s all about what he learns and how this translates to everyday dog ownership….